Mother’s Day weekend is here and we have great items for the mom and grandma in your life. We have all types of custom jewelry, scarves, cutting boards, glass items, mugs, greeting cards, all one of a kind by Missouri artists. Love Blankets on sale. Purchase one of four styles of blankets with Sherry Salant’s art for $48 and all proceeds go to Stray Rescue. They are plush 50 x 60 inch blankets for a great cause. We have over twenty truly remarkable artists in the fields of metal, mosaics, photography, oils, watercolor, glass, ceramics, graphite drawings, jewelry, pen and ink and alcohol ink. 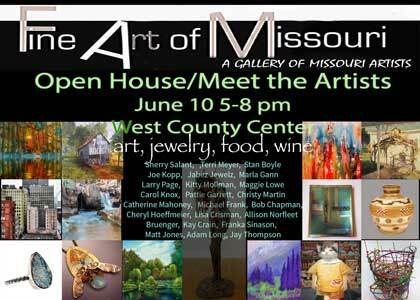 Many of these artists have the designation ” Best of Missouri Hands” and all of the artists live within 120 miles of Saint Louis. You will be able to meet all of the artists and make a connection with the art and yourselves. Because we are all here, we are happy to work one on one with our customers to create custom pieces for your specific needs and wants. Our turnaround time on a reprint is less than a week. When ordering canvas or metal, our turnaround time is 2 weeks. We love to do custom originals for you, too. You will find original pieces, limited edition prints, framed and matted art, and matted art that you can frame yourself.